Welcome to Downtown Lipscomb Texas ! LIPSCOMB, TEXAS. Lipscomb, the county seat of Lipscomb County, is on State Highway 305 in the central part of the county. Originally its site in Wolf Creek Valley was deemed a cattleman's paradise. In 1886 J. W. Arthur, anticipating the arrival of the Panhandle and Santa Fe Railway, established a combination store and post office at the site. Arthur named his townsite Lipscomb, after pioneer judge Abner Smith Lipscomb.qv Frank Biggers, the county's leading developer, organized the town company, which sold land for three dollars an acre. The next year, Lipscomb was elected county seat after a heated contest with the rival townsites of Dominion and Timms City. John Howlett operated a general store; John N. Theisen took over the Gilbert Hotel after its move from Dominion; H. G. Thayer managed a saddle and harness shop. A school district was established for the community. Liquor flowed freely at the Alamo Saloon until 1908, when the county voted to go dry. As it turned out, the railroad routed its tracks south of the townsite. Subsequent attempts to get a railroad line to Lipscomb were unsuccessful, as was the attempt of local businessmen to develop a coal mine in 1888, after a five-inch vein was discovered in the area. 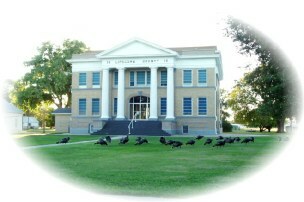 The present courthouse was built in 1916. The community's position as the county seat, coupled with the success of W. E. Merydith's real estate ventures, has enabled the town to survive. By 1910 several churches, a bank, a drugstore, and various other businesses had been established there. Lipscomb has had two newspapers, the Panhandle Interstate and the Lipscomb County Limelight. Only two businesses and the post office remained at the community by 1980. Nevertheless, the importance of the town as a farming and ranching center, along with oil and gas explorations in the vicinity, kept Lipscomb's economy alive. For most of the twentieth century, its population level has remained fairly stable: population was reported as 200 in 1910, 175 in 1930, 200 in 1940, and 190 in 1980. By 1990 it was estimated as forty-five. Though in the early 1990s Lipscomb remained the smallest town in the county, was off the main highways, and lacked rail facilities, it was still the permanent county seat. BIBLIOGRAPHY: A History of Lipscomb County, Texas, 1876-1976 (Lipscomb, Texas: Lipscomb County Historical Survey Committee, 1976). F. Stanley [Stanley F. L. Crocchiola], The Lipscomb, Texas, Story (Nazareth, Texas, 1975).